In Cam's recent visit to WTTW, he shares why he's running for MWRD Commissioner. 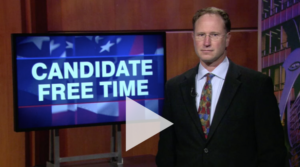 In Cam’s recent visit to WTTW, he shares why he’s running for MWRD Commissioner in a 1 minute, 45 second video. View the full video HERE or by clicking the image above. Sign up here for updates or follow Cam on Facebook or Twitter.